Getty Family FX Drama 'Trust' Debuts Official Trailer - Watch Now! Trust, the upcoming FX drama series based on the life of J. Paul Getty, just got an official trailer, which you can watch right here! The show follows the trials and triumphs of one of America’s wealthiest and unhappiest families, the Gettys. Equal parts family history, dynastic saga and an examination of the corrosive power of money, Trust explores the complexities at the heart of every family, rich or poor. 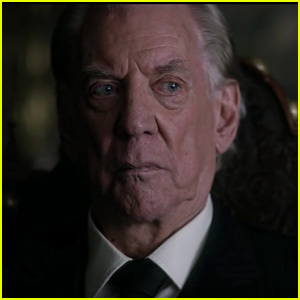 Donald Sutherland plays the Getty patriarch. The show also stars Harris Dickinson, Michael Esper, Hilary Swank, Brendan Fraser, Anna Chancellor, Norbert Leo Butz, Charlotte Riley and Luca Marinelli. The show premieres on March 25 on FX. Watch the trailer below! Hilary Swank looked bold in blue at the 2018 Winter TCA Tour! The 43-year-old actress matched the carpet at the event held at The Langham Huntington on Friday (January 5) in Pasadena, Calif.
She sported a sheer blue top, matching velvet pants with a bow belt, black heels, and a simple gold necklace, completing her look with a touch of pink lip gloss. She was joined by her Trust co-stars Donald Sutherland, Harris Dickinson, Michael Esper, Brendan Fraser, Anna Chancellor, Luca Marinelli, director Danny Boyle, and creator Simon Beaufoy. The cast spoke on stage during the FOX/FX portion of the event. FYI: Hilary is wearing Giorgio Armani.